Introduction: Fundamentals of Laparoscopy (FLS) is the standard for demonstrating competency in basic laparoscopic skills. 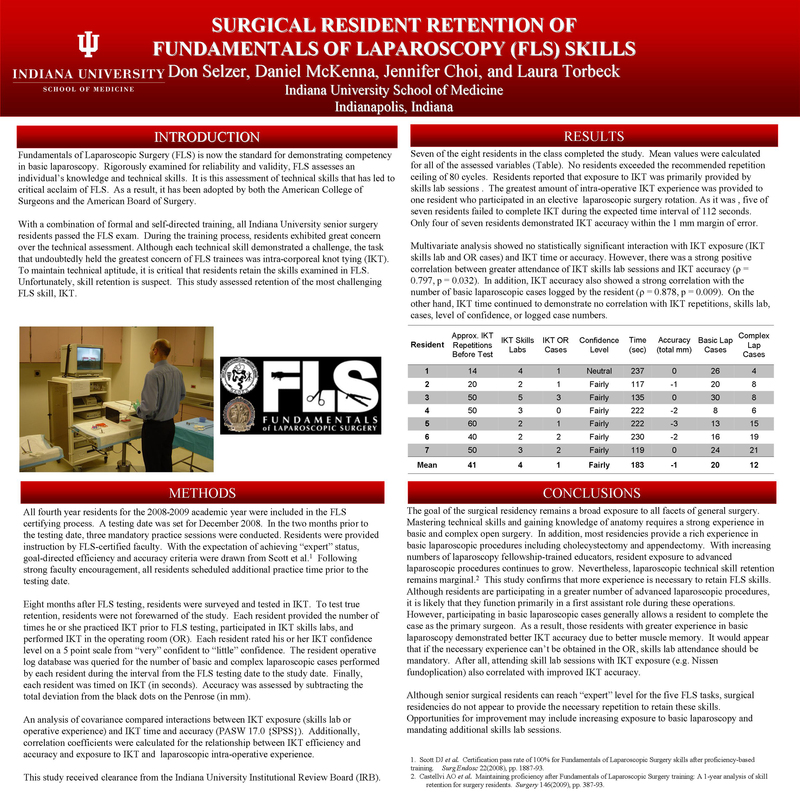 With a combination of formal and self-directed training, all senior residents in our program passed FLS. After testing is completed, it is critical that surgical residents retain the skills examined in FLS. Unfortunately, skill retention is suspect. This study assesses retention of the most challenging FLS skill, intra-corporeal knot tying (IKT). Methods: Eight months after FLS testing, residents were surveyed and tested in IKT. To test true retention, residents were not forewarned of the study. Each resident provided the number of times he or she practiced IKT prior to FLS testing, participated in IKT skills labs, and performed IKT in the operating room (OR). Each resident rated his or her IKT confidence level on a 5 point scale from “very” confident to “little” confidence. The resident operative log database was queried for the number of basic and complex laparoscopic cases performed by each resident during the interval from the FLS testing date to the study date. Finally, each resident was timed on IKT (in seconds). Accuracy was assessed by subtracting the total deviation from the black dots on the Penrose (in mm). Results: Seven of eight chief residents completed the study (table). Mean values are provided (table). Analysis of covariance showed no interaction with exposure and IKT time or accuracy. No correlation was shown between IKT time and the variables. However, IKT accuracy strongly correlated with IKT skills labs attended (ρ = 0.797, p = 0.032) and basic laparoscopic cases logged (ρ = 0.878, p = 0.009). Conclusions: FLS is the most widely used method of assessing laparoscopic skill competency. With practice, senior level surgical residents can reach “expert” level for these five tasks. Despite formal curricula and increasing laparoscopy fellowship-trained educators, resident technical skill retention is marginal. Five of seven residents failed to complete IKT in a timely manner. However, IKT accuracy demonstrated more staying power. Attending skill lab sessions and participating in basic laparoscopic cases that truly allow a resident to do the case increased IKT accuracy. It is clear that more experience than is currently provided is necessary to retain FLS skills. If experience can’t be obtained in the OR, skills lab attendance should be mandatory.